AN-LAN-EXT-ENH-200-POE Single Port PoE Ethernet Extender is a high-speed Ethernet transmission device. It can transmit Ethernet and Power signals together for PoE devices. It transmits data network signal up to 500 meters over any pair of 2-wire such as Cat5, coaxial cable and power line, etc. The maximum physical bandwidth can reach 200Mbps. It supports PoC and PoE functions. Max physical bandwidth reach 200Mbps (actual bandwidth 100Mbps). Network & Power can be transmitted over 2-wire. The total PoE power output is 30W(at) and it can be attenuated when transmitting through cable. Distance is longer, attenuation is more. Power loss and attenuation differs from the cable types. The following PoE power distance chart is just for your reference. In the above figure, the left vertical coordinate is PoE power output, the below horizontal coordinate is PoE transmission distance, please simultaneously contrast the horizontal and vertical coordinate to get accurate corresponding power output. Provide PoE Power Supply for front-end PoE device (The device only supports PoE Output, don’t support PoE Input). Provide low voltage 12VDC for front-end device. When transmission distance is long, to avoid output voltage dropping too much, also provide 48~56VDC power supply for slave unit, at the same time master unit also get power from it. When connect 12VDC power supply for master unit, because long distance causes output voltage to drop too much, it can’t satisfy slave unit power requirement, also provide 12VDC power supply for slave unit as supplement. 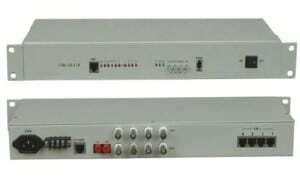 Tips: The power consumption supports PoE / Non-PoE equipment power supply standard, due to the difference of line loss and transmission distance, it may not be able to meet simultaneously two kinds of power supply requirement, only through dip switch setting to choose one kind of power output mode. When you use AN-LAN-EXT-ENH-200-POE, please follow the below tips as a reference, in order to reduce the fault in the process of using and the inspection work. The device supports auto-negotiation allocation master and slave. It also can be set master-slave side and grouped by the software. Each group (one point to multi-point communications group) only allows one Master, others are Slaves. Otherwise, the network data won’t be able to transmit. Make sure the electrode of transmission cable is consistent, otherwise, it is easy to cause the power failure. Please choose matching power adaptor (12VDC or 48～56VDC). 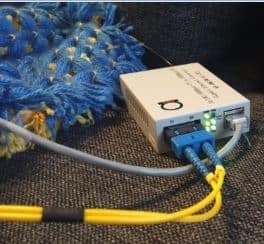 Above demonstrates how PoE feature work – once you enable it, remote unit get power from local one via same twisted pair along with Ethernet signal. So, the place where you have your IP camera does not requires power any more. It consists of the master unit and slave unit. By PoE power equipment, it can directly supply power for the remote unit, supporting point to point and point to multi-point. It can greatly simplify the project cabling, applied to expand network system and transmit long distances of PoE device signals.